It's morning, your bedroom is cloaked in total darkness, and you need to grab some clothes from the closet without turning on all the lights and waking up your other half. These cool new Hang Up Lights are the solution. 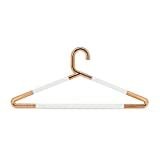 These futuristic coat hangers illuminate closets, bedrooms, bathrooms, or anywhere you hang them with a soft white light from two frosted sections at the touch of a button, but they aren't too bright to awaken others. They feature a copper-like finish, A great way to avoid arriving to work looking like you got dressed in the dark. Hmm, the only downside would be searching around in the darkness to even find these hangers to turn the lights on, but I guess that's what the flashlight app on your phone is for.